The cruise control main switch operates 7 functions: SET, -, TAP-DOWN, RES, +, TAP-UP, and CANCEL. The SET, TAP-DOWN, and - functions, and the RES, TAP-UP, and + functions are operated with the same switch. The cruise control main switch is an automatic return type switch which turns on only while it is being operated in the direction of each arrow and turns off after being released. 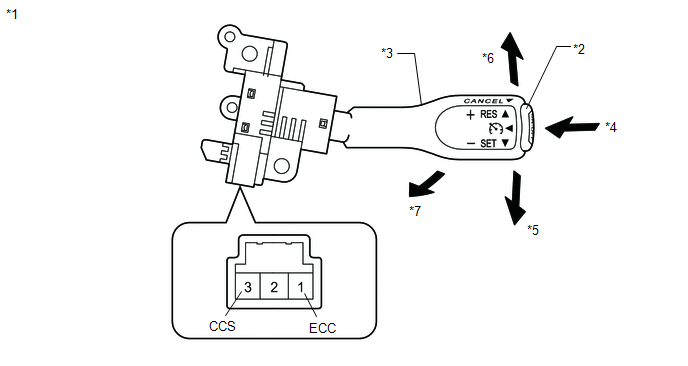 The internal contact point of the cruise control main switch is turned on with the switch operation. 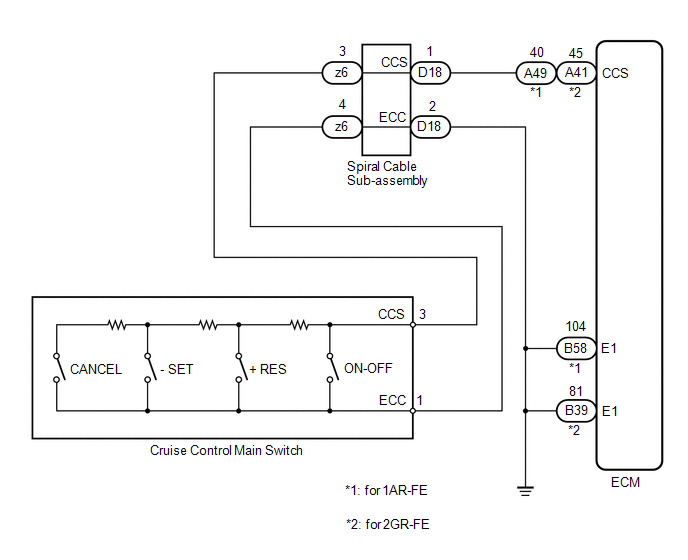 Then the ECM reads the voltage value that has been changed by the switch operation to control SET, -, RES, +, and CANCEL. 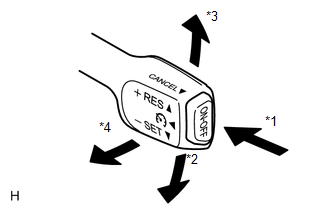 (e) Check the Data List for proper functioning of the cruise control main switch. 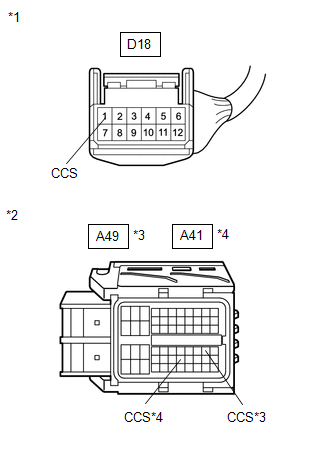 (a) Remove the cruise control main switch (See page ). 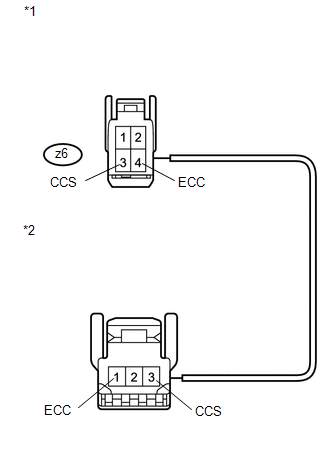 (c) Reinstall the cruise control main switch (See page ). 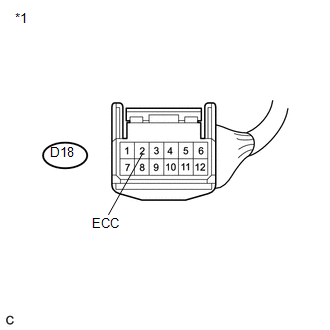 (a) Remove the steering pad (See page ). (b) Disconnect the cruise control main switch connector. (c) Disconnect the spiral cable sub-assembly connector. (e) Reconnect the spiral cable sub-assembly connector. (f) Reconnect the cruise control main switch connector. (g) Reinstall the steering pad (See page ). The spiral cable sub-assembly is an important part of the SRS airbag system. 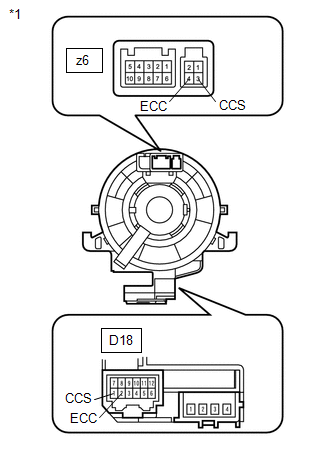 Incorrect removal or installation of the spiral cable sub-assembly may cause airbag deployment. Be sure to read the page shown in the brackets. (a) Remove the spiral cable sub-assembly. The spiral cable makes a maximum of approximately 5 rotations. (c) Reinstall the spiral cable sub-assembly. (b) Disconnect the spiral cable sub-assembly connector. (d) Reconnect the spiral cable sub-assembly connector. (a) Disconnect the spiral cable sub-assembly connector. (c) Reconnect the spiral cable sub-assembly connector.